Any stagecoach to somewhere needs a starting point. This has to be the place. 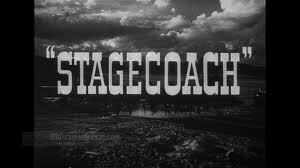 ‘Stagecoach’ is the finest Western ever made and one of the great films of American cinema. And yet it is far from perfect. The characters are familiar types and Lindsay Anderson in his book ‘About John Ford’ says the characters are not sharply drawn. Neither is the plot always advanced convincingly. The escape of the stagecoach from the Apaches is not credible. Earlier, the Ringo Kid decides to abandon fleeing because he sees smoke signals in the hills but they should have no significance. The event only occurs because it allows us to pretend that the passengers need to board the stagecoach quickly. Throughout the film there has been talk of how Geronimo is on the warpath. And no one believes in the change of heart by Marshall Curly when he lets Ringo disappear for a few minutes to exact revenge. American critics insist, possibly correctly, that the film represents the birth of America and democracy but it always reminds this jaded European about the importance of destiny. The people try to decide their fate but the meetings and votes organised by Marshall Curly are shambolic and they offer no hope for those who believe in democratic potential. Doc Boone sums up the mood when he argues that if a bullet is waiting for him there is little he can do to prevent it happening. If Anderson correctly says that the characterisation lacks sharp detail he also misses a key strength. True, we have an alcoholic doctor whose self-destruction is never properly explained and neither are the reasons for the downfall and exile of the Southern gentleman, Hatfield. But the ambiguity of the characters is a key reason why Stagecoach is a masterpiece. The travellers are human and contradictory. The only exception to this rule is Gatewood, the banker. He is irredeemably bad and selfish but in 1939 the banks had recently created an economic crisis and mass unemployment. Left wing screenwriter Dudley Nichols was determined to make a political point. This is obvious from the sign on the front of the bank. ‘Capital $50,000, Assets $250, 000.’ It is not their money and they are too fond of leverage. We even recognise that Hatfield and Mallory, the snobs on the stagecoach, are products of a narrow social system. They can be decent although only with their own kind. All the characters leave mysteries behind in our minds. The meek Peacock has five children and, after Mallory has given birth at the station, Peacock becomes more assertive as if he has been reminded of his manhood. We also think that he is too timid to stop Boone from stealing his whisky samples but there is a moment when Peacock suddenly asserts, ‘I don’t mind you taking my samples.’ Not coincidentally, we now realise the extent of the decadence that weakens the likeable Boone. The intrigue between the characters is minimal. Instead, they puzzle us, the audience. And the mystery behind them is the biggest of all. Why is it them on the stagecoach and just what is the part they and we play in the things that happen. This complementary mix of ambiguous character and the importance of circumstance make the film stand repeated viewings. Ford is a contrarian who likes to be provocative and his films often contain contradictory arguments. ‘Stagecoach’, though, grasps what is important about character, which is that we are all unknowable and what we believe about others and even ourselves is assumption. This is confirmed in the never explained glances and expressions that dominate ‘Stagecoach’. The ambiguity of our neighbours is also emphasised by the performances. The Broadway actress Louise Platt is charming as Lucy Mallory but her character is not sympathetic. The scene at the dining table in Dry Fork is as nuanced as Chekov. The disgust of Mallory, though, when Dallas sits next to her is quite chilling. smoke from his cigar. None of her actions or words implies merit. 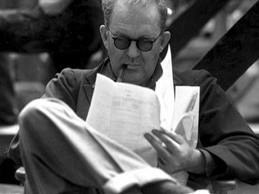 If Mallory is the villain disguised by her refined features she leads us to the populism at the heart of John Ford. He is an old-fashioned man who believes that men should be heroes and women should nurture. His sympathy for the whore does not weaken the misogyny. It is, in fact, a consequence. My view is that Ford is simply scornful of ambition and achievement. This is why he was so uncomfortable with people who praised him. He believes in those that prevail. Struggle, not success, is what is important. But no single interpretation of the movie is valid. The first passenger on the stagecoach we meet is Dallas and, when she is joined by Boone, a member of the female busybodies says, ‘Two of a kind.’ The contradictions make us all two of a kind and our contradictions ensure that we are two of a kind with others. Apart from the villainous banker all the characters are reflected in someone else so they form pairs but these pairings change during the journey. Even the bystanders form pairs. None of us exists alone. Dallas and Ringo find a happy ending. They are redeemed and can head for a Garden of Eden beyond corrupting civilisation. John Wayne plays Ringo and he exists as a source of masculine strength that is essential for progress but Dallas dominates the film and the final scene is moving not because Wayne has shot his enemies but because Dallas has escaped what should have been her fate. All the characters in the film make moral progress. This is not because they realise that with the help of John Wayne they can kill a lot of Indians. When Dallas helps with the birth of the baby she not only seizes life but her opportunity to be honoured. Her achievement is what redefines them all. Ford was an audacious talent and his mastery of detail contributes to what we experience and our compulsion to interpret. Because we are moved, we seek explanations that Ford ignored because he was busy ensuring we responded emotionally. For example, in the opening shot of the town Tonto, a lone horse follows the stage into town. It is a highlight that brings everything to life. When the cavalry says goodbye to the stagecoach the scene should have little consequence but Ford organises perfectly what happens. We have a fabulous shot of the young lieutenant waiting at the crossroads between his troop and the stagecoach. Landscape and responsibility dwarf everyone. The stagecoach leaves for the wilderness alone and the sight of the stagecoach becoming smaller and more vulnerable is particularly poignant. 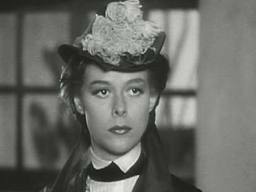 Orson Welles stole the effect for a scene in his film ‘The Magnificent Ambersons’. Supposedly Welles watched ‘Stagecoach’ 40 times before making his masterpiece, ‘Citizen Kane.’ Well, there you go. If you want to read about what the author experienced in Brazil click here. If you want to read about what the author and others say about another famous icon click here. If you now want to see the film Stagecoach click here. 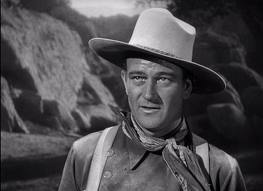 I am not a huge fan of John Wayne, mainly because of the ‘all American’ hype which, for me, has blurred any distinction between the actor and the man. This may be irrelevant in relation to this film in which Wayne is not the only star performer and I have been a long time admirer of Claire Trevor’s work . Howard, in this piece, provides a thought provoking, informative and incisive analysis of the film which actively encourages me to watch it again in an effort to pick up on the themes and nuances of which he has now made me more aware.